IHS Markit says that global AMOLED production capacity is set to grow from 11.9 million square meters to 50.1 million sqm in 2022 - that's a 320% growth in 5 years. Samsung and LGD will remain the market leaders and Korea will have a market share of 71% in 2022 (down from 93% in 2017). China-based OLED makers will have a market share of 26% in 2022 (up from 5% in 2017). IHS says that the majority of OLED capacity will still be used to produce RGB (direct-emission) OLEDs in 2022. 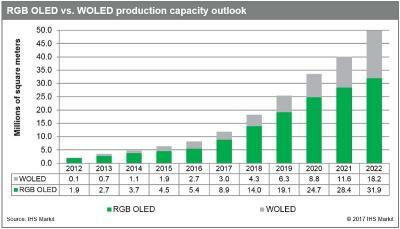 RGB OLED production capacity will grow from 8.9 million sqm in 2017 to 31.9 million sqm in 2022. WOLED (WRGB) OLED TV panel capacity will grow from 3 million sqm in 2017 to 18.2 million sqm in 2022.